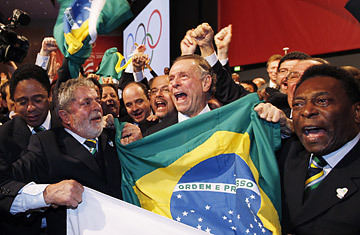 Brazil's President Luiz Inacio Lula da Silva (left) Rio 2016 bid President Carlos Arthur Nuzman (center) and Brazilian soccer great Pele (right) celebrate in Cophenhagen after it was announced that Rio de Janeiro has will host the 2016 Summer Olympic Games. Rio de Janeiro is rightfully and proudly celebrating a historic victory: being named the host city for the 2016 Summer Olympics, the first South American city to host one of humankind's truly global extravaganzas. If all goes right, it will be a most memorable celebration. Athletes will participate either in or close to world famous icons such as the Maracana soccer stadium, the spiritual home of the "beautiful game," and bodacious Copacabana beach. Some events, like rowing or triathlon, will take place in the shadow of Sugarloaf mountain and the outstretched arms of Christ the Redeemer. Ah, but note that conditional: if all goes right. There is much preparation and building to do. And if it all doesn't go right, the Olympic celebration is likely to lead to much recrimination. There are eight existing venues that need to be renovated in time for the Games, including the João Havelange Stadium where the track and field events will take place. Three of the venues are new, built for the Pan Am Games; however, they do not meet the IOC's size or technical standards. The velodrome for track cycling, the aquatics center for diving and water polo and the João Havelange Stadium all need extensive work. The existing sites for archery, sailing, rowing, equestrian, shooting, kayak and rowing, as well as the route of the marathon also need work. All told $200 million has been set aside for upgrades. Meanwhile, another 11 permanent venues costing an estimated $674 million are to be constructed for basketball, judo, taekwondo, wrestling, handball, modern pentathlon, fencing, tennis, swimming and synchronized swimming, canoe and kayak slaloms, and BMX cycling. Then, at least $78 million will be spent on seven temporary structures for beach volleyball, triathlon, marathon swimming, race walking, road cycling, weightlifting, hockey, mountain biking and modern pentathlon. Rio has promised to spend $427 million on an athlete's village that replicates "the outdoor lifestyle of Rio's beachside neighborhoods" (and no doubt swings to the sounds of samba and bossa nova). And, for an even greater taste of Brazil, a dedicated shuttle bus will take athletes to a beach set aside exclusively for participants. As if that isn't enough to deal with, two very large issues are tourist lodgings and security. Rio lacks hotel rooms, and although it has promised to increase the number available before 2016, some of the promised beds are on private cruise ships, a situation that worried the IOC enough to question the strategy's reliability and accountability. Another issue is street violence. The games committee lauded what they called Rio's "increased public safety and reductions in crime." But the number of homicides in the city is rising again and is up 9.9% so far this year. Officials would likely flood the city with troops and police as they did for the Pan Am Games in 2007. But such a military presence will weigh down any party atmosphere. Safety remains a troubling issue. Nevertheless winning the Games is a huge boost for Rio. The decision promises to transform a city that has fallen into disrepair and has been looking for a purpose since losing its capital city status in 1960 to the modernist built-to-order jungle metropolis of Brasilia. The massive investment will rejuvenate it. In fact, organizers and government administrators believe that every Brazilian real spent on the Games will generate three in profit. The entire Olympic bid has been extremely popular: one study showed 85% of Cariocas and 69% of Brazilians supported the city's candidacy. Indeed, Cariocas consider the 2007 Pan American Games a big success, but they do so by overlooking the costs and organizational snafus. To secure the Pan Ams, Rio promised to transform the city with a new ring road system, a "via light" highway, a new state highway and 54 km of new metro line. Guanabara Bay, the fetid body of water whose smell assails visitors driving into town from the international airport, was to be cleaned up. None of those plans came to fruition, prompting the current mayor, and former state Sports Secretary, to admit that the city promised too much and provided too little. The Brazilian government may have to step in to help out. How it will do so will be clearer in the next two years as the country prepares for the 2014 World Cup. So far, the indications are not great. The country was awarded soccer's big championship almost two years ago, but work has yet to start on the 12 stadiums needed for that spectacle. Meanwhile, a much-talked about bullet train linking São Paulo and Rio is yet to leave the drawing board. Many officials now doubt whether it will be ready in time for the World Cup. Brazil and Rio can party now and celebrate. But then it's time to roll up sleeves. There's a ton of work to do if they want to throw an even bigger party in 2016. See pictures of Rio de Janeiro on LIFE.com. See highs and lows from the 2008 Beijing Games.